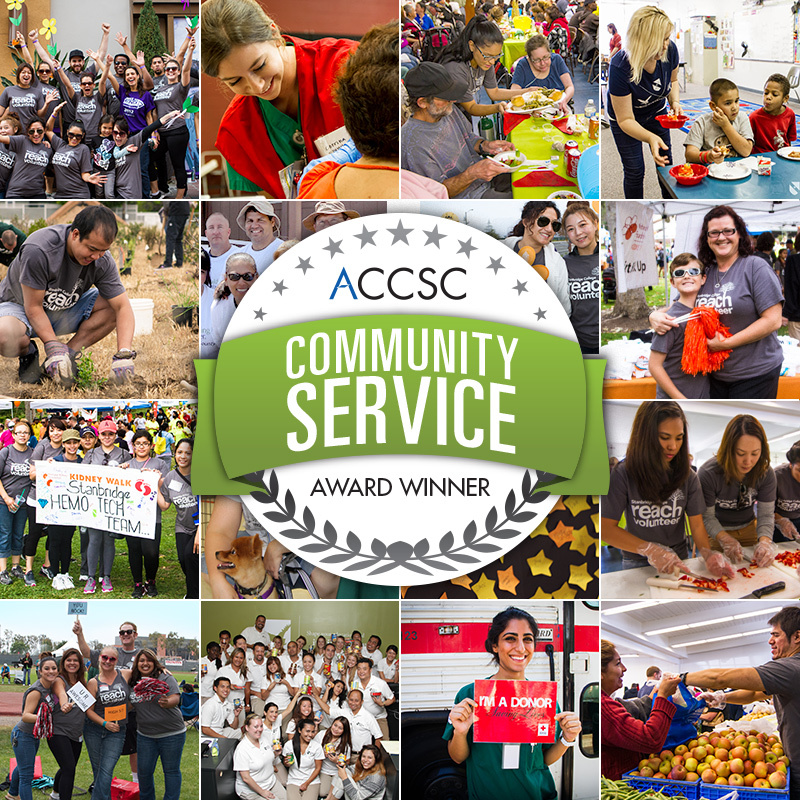 Stanbridge College was named the 2013 ACCSC Community Service Award Winner by the Accrediting Commission of Career Schools and Colleges (ACCSC), which accredits over 790 colleges and universities. Each year, the accrediting agency selects one ACCSC-accredited institution that has made outstanding contributions to their local community through service initiatives to receive this award. Stanbridge College has also been admitted to the President’s Higher Education Community Service Honor Roll by the Corporation for National and Community Service for four consecutive years in 2009, 2010, 2011 and 2012. This award is the highest federal recognition a college or university can receive for its commitment to volunteering, service-learning, and civic engagement. In 2012 – 2013 Stanbridge College increased its community service activities by 57%, supporting 87 events by raising funds, volunteering time, and promoting awareness. Staff, students, and alumni provided over 6,129 man hours of community service and donated over $82,000 to help its community. Stanbridge College continued and established several new long-term partnerships including: co-founding the Free Pantry Organization that has distributed over 250,000 lbs of food free of charge to the needy, serving over 9,000 meals to homeless and low-income families, raising over $10,000 for new dental chairs for the Lestonnac Free Clinic that serves the poor, advising senior citizens on nutrition and health, and restoring the natural beauty of the Upper Newport Bay on a monthly basis with Orange County Parks. 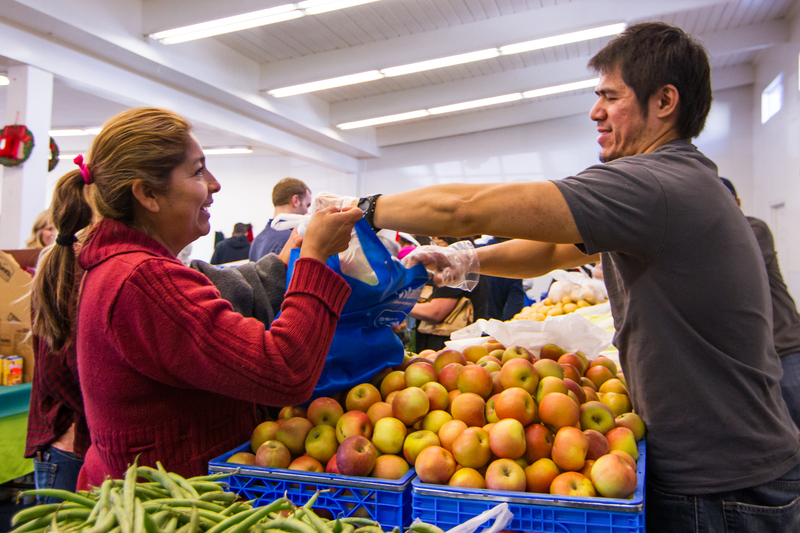 Stanbridge College increased its community service including co-founding the Free Pantry Organization that has distributed over 250,000 lbs of food free of charge to the needy. For over 17 years, Stanbridge College has been committed to serving the Orange County and global communities by providing healthcare services, feeding the homeless, donating aid to victims of natural disasters and global civil turmoil, and caring for active military and veterans and their families. Throughout the year, Stanbridge College partnered with over 24 non-profit organizations to help distribute funds raised including Free Pantry Organization, Second Harvest Food Bank Orange County, Lestonnac Free Clinic, Illumination Foundation, and Toys for Tots Marine Foundation. The service learning component of Stanbridge College REACH enables students to apply their knowledge and skills learned in the classroom to community service while earning credit in a structured learning environment. As part of its service learning program, Stanbridge College Allied Health students have worked with the County of Orange and the Orange County Medical Reserve Corps to help deliver medical services to the public. For the 2013 Community Service Award, ACCSC considered several compelling aspects such as the impact of community service initiatives, the commitment of a school to its community, and a demonstration of how the initiatives touched the personal lives of students and members of the community. This is the second consecutive year in which Stanbridge was recognized by the ACCSC for their community service achievements. Stanbridge College was recognized with the award at the 2013 Professional Development Conference hosted by ACCSC on September 11-13, 2013 in Washington DC. To learn more about Stanbridge College REACH community service efforts, please visit www.stanbridge.edu. Based in Irvine, CA, Stanbridge College is a co-educational college with an annual enrollment of over 1,100 students. Founded in 1996, Stanbridge is nationally accredited by the Accrediting Commission of Career Schools and Colleges (ACCSC). Stanbridge College offers Master, Bachelor and Associate of Science degrees and diploma programs in Allied Health and Information Technology. In 2009, 2010, 2011, and 2012, Stanbridge College received an award from Institutional Research & Evaluation, Inc., as one of America’s Best Technical Colleges. In 2008-2009 Stanbridge College was the recipient of the School of Excellence Award from the Accrediting Commission of Career Schools and Colleges (ACCSC), and since 2007 it has maintained one of the highest continuous pass rates in California on the NCLEX-PN nursing exam, with a 93% six year average pass rate. Stanbridge has been named to the 2009, 2010, 2011, and 2012 President’s Higher Education Community Service Honor Roll, the highest federal recognition a college or university can receive for its commitment to volunteering, service-learning and civic engagement. For more information, please visit www.stanbridge.edu or call (949) 794-9090. The Accrediting Commission of Career Schools and Colleges ACCSC) is dedicated to ensuring a quality education for more than 250,000 students who annually pursue career education at 800 accredited institutions located across the United States. ACCSC’s scope of recognition with the U.S. Department of Education includes the accreditation of private, postsecondary, non-degree-granting institutions and degree-granting institutions, including those granting associate, baccalaureate and master’s degrees, that are predominantly organized to educate students for occupational, trade and technical careers, and including institutions that offer programs via distance education. Read more about ACCSC online at www.accsc.org.